Edinburgh Accies withstood a late fightback by the hosts to emerge with a 28-17 win away to Musselburgh that keeps them in the BT National Division One promotion race. Accies dominated possession in the first half but struggled to break down a solid defence and reached the break with only a 7-3 lead after Jamie Sole dotted down and Andrew Bell converted before Danny Owenson responded with a penalty. The Capital men restarted well and within ten minutes had stretched their lead with converted tries from Alex Glashan and Jack Paterson. At that stage, there appeared to be no way back for the hosts, who had rarely featured in an attacking sense. 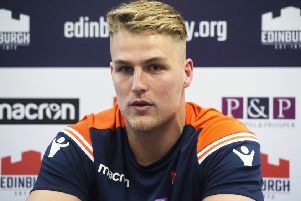 However, the Burgh defence repelled another wave of Accies attacks then, with 15 minutes to play, Luke Hutson crossed for a try, converted by Owenson, who also added the extras when Danny Ritchie dotted down four minutes later. For a moment it looked as if the Stoneyhill men would go on to wine, but Tom Drennan quelled the nerves with a fourth Accies try, converted by Bell. “Accies last year or the year before wouldn’t have got through a game like that so for us it’s a pretty good test of our character to come up against a team that challenged us up front and we came through it with five points,” said Accies coach Derek O’Riordan whose side also received a boost from a 25-17 home defeat for Jed-Forest against Stewart’s Melville. First-half tries by Seb Trotter and Gareth Henderson were converted by Mike Hanning, who also slotted two penalties to give StewMel a 20-10 interval lead. And the visitors clinched a valuable victory when Sean Murchie bagged his side’s third try.